THE AQUALITE TRAVEL GRIP IS A COLLAPSIBLE CAMERA GRIP THAT CAN HOLD A CAMERA WITH UP TO TWO AQUALIGHT PHOTO/VIDEO LIGHTS. 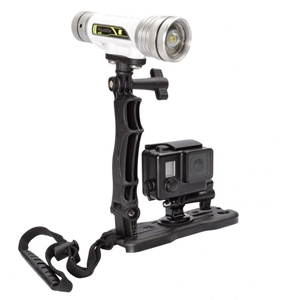 This grip comes included with all new purchases of an Aqualite Pro 100 light, or it can be purchased as an accessory. Perfect for GoPro and any other compact underwater camera. It collapses down to a tiny 6.5" x 2.5" x 1.5" when not in use. This makes it perfect for travel or any time you need to conserve space. When collapsed, it will easily slide into a backpack, a laptop bag, or even your pocket. 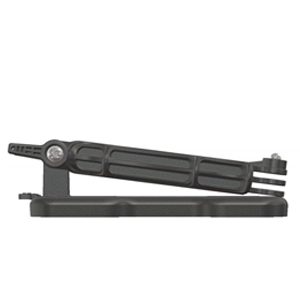 The sturdy but lightweight design makes this a perfect grip for underwater use. Strong, reinforced, non corrosive composite and stainless steel construction makes it practical to use so that bumping into obstacles won't break your grip, but it also doesn't weigh you down and is always easy to carry with you. Resists saltwater, sun and impact damage for years. The grip's ergonomic handle is tilted forward and inwards to accommodate the body's natural position. This provides less wrist fatigue and level horizon shots. It also has finger grooves for better grip and is small to be comfortable while wearing gloves. Folds down to 6.5" x 2.5" x 1.5"